As the summer is nearing an end and we enter into September, there are now only eight more Sundays until we reach the Feast of Christ the King and begin to look to the coming of Advent and the new liturgical year. We have a few important announcements for this month, but firstly I wanted to share with you a brief update on the matter of attendance at the 12:30 pm Sunday Latin Mass at St. Ann. … in short, we are growing! Please view the attached chart which shows the attendance tracked for the previous 11 months. 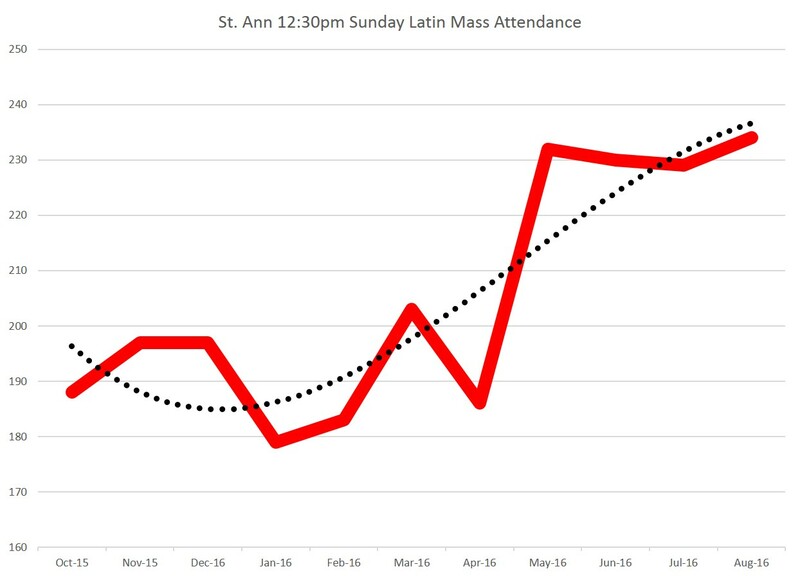 One thing that is not shown in this graph, is that in previous summer months when so many families travel, the Latin Mass average attendance would fall down to the 100-120 range in similar proportions as the Novus Ordo Masses. This year, however, after a concerted outreach program led by our Latin Mass Steering Committee, instead of falling, the Latin Mass attendance grew throughout the summer months. Let’s pray that this growth continues into autumn and beyond. Black Cope Needed: Our first announcement this month is rather timely and urgent. We need to quickly raise about $2,500 for St. Ann Parish to purchase a black cope to complete the full set of black vestments in time for All Souls Day on November 2nd. There will be Solemn High Requiem Mass for the Feast of All Souls and the current set of vestments does not currently have a cope. To make an online donation, please follow this link to the St. Ann online donation page. In the long list of donation funds, about the 10th item from the bottom of the list is an account called “Latin Mass Priest Vestments“, you can make your donation there. If you would rather give with a physical check, you can always drop an envelope in the collection basket with a note designating the donation (e.g. Latin Mass Priest Vestments or Black Cope). May God reward you for your generosity. First Fridays Update: Reminder that this coming Friday, September 2nd is a First Friday. There will be Low Mass at 7am as per normal. Also note that next month in October, the First Friday falls on Oct 7th which is the Feast of Our Lady of the Rosary, and as such, the Mass will be moved to the evening for a special Missa Cantata at 7:00 PM. Holy Cross Day: On Wednesday, September 14th, the regular Wednesday evening Mass at St. Ann will be a special Missa Cantata for the Feast of the Exultation of the Holy Cross. Basics of Ecclesiastical Latin: If you are moved by the beauty of the Mass in Latin, consider taking a Latin enrichment class. This class will be for 1 hour on Saturdays (approximately 9am-10am) from September to May, immediately following the beautiful Low Mass in Latin which begins at 8:15am and is celebrated by Fr. Matthew Buettner. This class is open to anyone ages 9 to 99. Latin I: This Latin class is perfect for those in the homeschooling community (8th – 12th grade) who are seeking a high-school level equivalent Latin class for credit (credit transfer possible for public and MACs schools). The class will meet weekly during the school year, from 9-10am on Mondays, immediately following the morning Mass celebrated by Fr. Buettner. This class is also open to adults who are interested in a deeper and more rigorous introduction to Latin. No previous experience with Latin is required. Please contact John at Jwpublius (at) yahoo (dot) com to enroll or for more information.